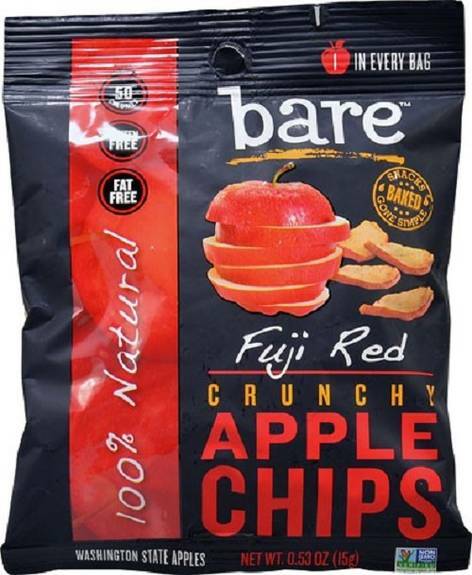 Bare Food Fuji Red Crunchy Apple Chips Are An Excellent Gluten-free, Fat Free Snack Choice. These Apple Chips Are Baked From Crunchy, Real Apples And Do Not Contain Oil, Added Sugar Or Preservatives. Bare Food Organic Apple Chips Are Also A Good Source Of Fiber, Non-gmo And Packaged For Your Convenience In A 0.53 Oz. Pouch. There Are Only 50 Calories In Each Serving Of Apple Chips And Each Bare Food Fuji Red Crunchy Apple Chips Pouch Contains 0.53 Oz. Of Product. This Product Is Made In A Nut Free Facility.